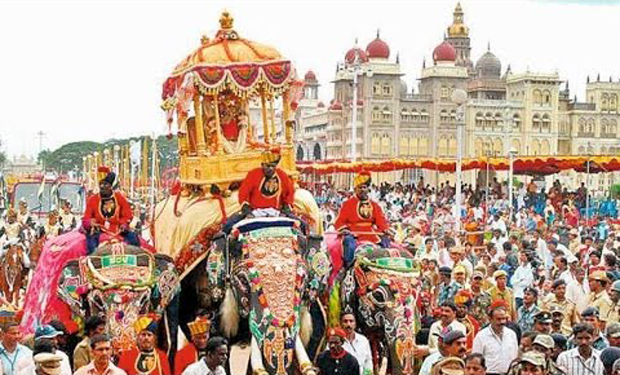 Mysuru, Aug 10: With just two months left, Karnataka’s flagship Dasara festival has run afoul of People for the Ethical Treatment of Animals (PETA) India, which has opposed elephants in the celebrations. The organization will stage a dharna here on Thursday, calling for an end to the use of elephants in performances, including circuses and processions, and for tourist rides. This comes four days ahead of World Elephant Day. While officials have left the decision to the government, stakeholders in the tourism sector said Dasara is incomplete without elephants. Peta said elephants are used in the Vijayadashami procession during Mysuru Dasara. Elephants are protected under Schedule I of The Wildlife (Protection) Act, 1972, and have been declared a national heritage animal by the central government. However, they are excluded from the list of animals banned from performances under Section 22 of The Prevention of Cruelty to Animals Act, 1960. BS Prashanth, president, Mysuru Travel Agents’ Association, told TOI Dasara has been celebrated in Mysuru for over 400 years and elephants play a major role. “For two months before Dasara, elephants are given special food not available in the forest. The treatment is good,” he added. Good decision from PETA. Should ban elephants from all other states too. People are utilising elephants for thier personal use... for making money..
What rubbish DCF telling. Elephants are well treated it seems. DCF, you should realise one thing that elephants are not meant for these kind of activities. They are wild animals..